I have to be honest, I stumbled upon the Science Teaching Junkie's blog. Must have been one of those rabbit holes! Nevertheless, I am thankful that I did. It was exactly the push I needed to organize my desktop. You see, my desktop was (notice the word was) a hot mess! Folder within folder within folder of files and images. There were times throughout the school year when I had to present to teachers so I would create a file labeled "Stuff" and drag and drop everything on my desktop into it! (Can't be embarrassed by all the stuff on my desktop!) I think I had Stuff 1, Stuff 2, Stuff 3 . . . maybe a few more . . . at least that's all I'm admitting to at this point. 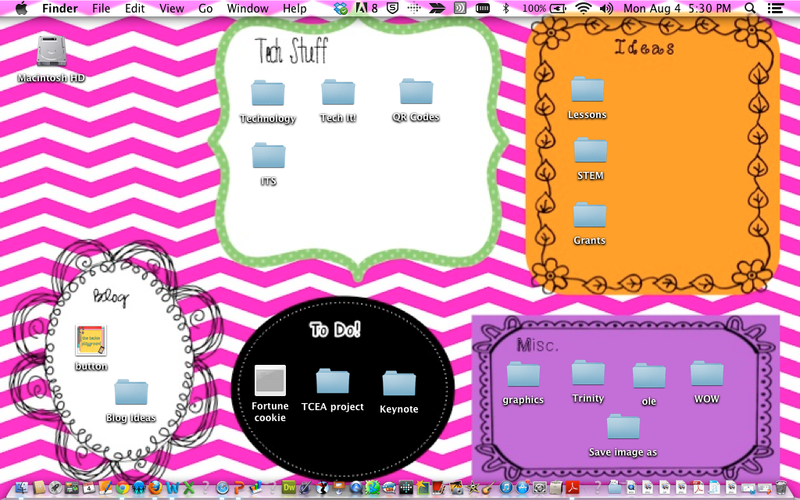 So, when I came across the Science Teaching Junkie's post about Organize Your Desktop, I froze! Super cute! Chevron! Adorable frames! Say-what?!!! The clouds parted . . . the angels began to sing . . . the post was speaking to me! Ok, maybe that's a tad bit dramatic . . .
Today, I worked for hours purging and organizing. I had to play with the sizing to fit my screen. Shayna does a great job of explaining how to create the background for your desktop. Head over to her blog to check it out! Plus, read about her other great teaching ideas.